2015 TNF for some T2F! I live in Mildura, which one might describe as “topographically subdued”. No hills. No stairs. 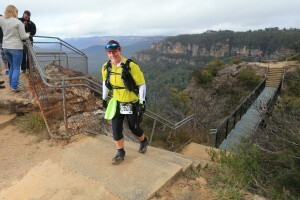 So why sign up for the hilly and stair-ey North Face? I’m mad. 3am weekday alarms. Long dark miles. Infinite repeats of a bridge abutment ramp. Sandhills with Toby. Toby makes me work. Toby helps my strength. Toby is round and heavy but if I chain him up and drag him around it’s a good workout. Toby is a big fat 4wd tyre……… I’m mad. They say ultra-running is mostly type 2 fun…. not fun when you’re doing it, but fun afterwards. T2F, with a little T1F. So I didn’t bring my husband on this trip………… now I could enjoy my own misery without the guilt of someone else’s! I started in the last wave as I’m always slow and sometimes last, but my goals were simple – finish in the time limit and enjoy. The first leg was ridiculous. Seriously. We went up. We went down. Repeat. A bazillion times. But the views were gob-smackingly awesome and the terrain unending fun (both T1F and T2F). The overhang parts were brilliant (if a little wet) and I did my very best to impersonate a cave troll for the sneaky cameras and tourists. I spent a little while with a runner who held their hands in the air when descending. Of course that quickly had me calling her Jazz-Hands! But I had a knee “thing” and sadly, I fell behind Jazz-Hands. At the 14km water stop I came good and then managed a fair bit of running – after all, the next checkpoint was the hospital. Convenient! I then considered the hospital might have been a quarantine spot for highly infectious diseases or really mad people, as it was a looooong way from town. Appropriate? I escaped that CP just ahead of the top male 100km runners and ticked down the hill at a nice jog. Then, coming around a corner, who do I see? JAZZ-HANDS!!! We walked and talked a bit more down through the steep stuff. When it was less steep I ran a little and before I knew it was tottering into the last waterpoint. Onwards and upwards! Yeah…… about that……… quite a ways up isn’t it? My knee did its thing and I teetered up the hill like a Thunderbird employed at Monty Pythons Ministry of Silly Walks (cue 70’s flashbacks). I encountered what must have been the races only leech after that little open grassy area – which then became the worlds first acrobatic flying leech. I gave myself another good layer of Bushmans and donated my can to the next marshal I saw just in case. The trail through the forest and across a couple of sketchy little creeks was super cool and totally T1F. 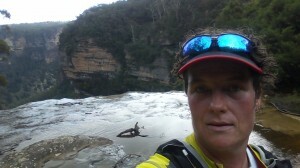 A bit more running to the bridge over the last creek and I had my first tumble of the day – 900m from the finish! I “bounced” up and began the “Ascent of the Furbers”……… Summited? Eventually. Finish line? Brilliant. So next year the 100? Wouldn’t dream of it. But yep, I’m still mad, so let the nightmares begin……… when can I sign up? “Toby, I think this is the beginning of a beautiful friendship”. Brilliant race. Brilliant people. Extra hats off to the marshals in all the out-of-the-way spots keeping us safe and on the right track. And cheers to the sweepers – damn happy I didn’t see you, but damn happy you were there. Seems you had a great day. Congratulations, ..... oh yeah, I'm sure you'll be back next year. T1F and T2F , is a concept I totally get. I loved Jazz Hands too! Thanks for sharing and wow- what a race- you are amazing! Wow! Who would've thought that a race that long could be summed up on a report that short? ! Well done! ! Nothing mad about the training. Good work. Thanks guys. I also had a crack at something a little more poetic for the report competition. Didn't get in the top 5, but here 'tis anyway ! Try this on for size Cranky - even shorter! To make sure I remembered it; since my memory is poor! I was there in Group 4, aiming for steady – but slow. I had all the right gear; but was it all show and no go? The pace was quite calm; we ran happy and light. We went up, we went down; views were great – what a blast! We went over and around, and HELL YEAH! I wasn’t last! Piles of chips and a loo – and a GIANT box of lollies. I saw people I’d seen, and made friends as we talked. Then up up and away, up up up up up … eek! More people ran past me, fast to finish the hundred. 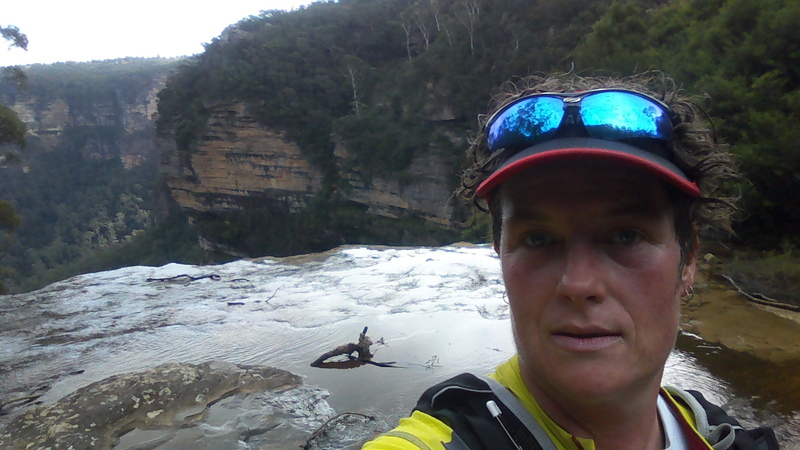 But my legs were like jelly – and I was just doing the fifty! Step by step I ascended – lights like breadcrumbs to my Gretel. Finish line! Yay! Round the corner I sprint! It’s over! I say – ‘till next year……… hint hint. There’s some that don’t get it, but that don’t get my goat. We live and we love, we feel pain – most won’t win it. But the road less travelled is TRAIL, so c’mon y’all, GET ON IN IT!! (*1) Might have been a possum. Or even a rat. But it stayed in the ceiling. (*2) Tom is the Race Director, who spends an inordinate amount of time talking about competitors wee’s and poo’s – owing to the fact we were racing in a World Heritage Area. (*3) Might actually have been a slug. But it was getting dark. It was black, slimy, had no legs, and was on MY leg. I wasn’t about to give it a physical exam. 1. Turts is a legend!! 3. Everyone should get the concept of T1F and T2F!! Woohoo! That made me reread this. As an afterword, I did attempt the 100 the following year. I pulled out at the Katomba checkpoint, around 55km, as I was, as it happens, very sick. I'm back on in looking redemption in the 100 in 2019!